“In the face of a shock, investors may be surprised to find themselves jammed running for the exit.” That quote is from Paul Tudor Jones, who was one of the pioneers of the modern hedge fund and is considered a brilliant investor and trader. He went on to say that things are “on the verge of a significant change” and that the current market reminds him of 1999. The current market reminds me of the demise of Pompeii, which was destroyed by the massive volcanic eruption of Mt Vesuvius in 79 AD. Pompeii was a prosperous city of the Roman Empire on the coast of southwest Italy. It sits at the base of Mt. Vesuvius, a volcano that had been dormant for a long time. Earthquakes and seismic activity, scientists believe, began to “warn” the population of Pompeii roughly 17 years before the big eruption, when a massive earthquake largely leveled Pompeii. Shortly before the eruption more signs began occurring, hinting that something wasn’t right. Though some people evacuated the area, most of Pompeii’s populace was not worried. The rest is history. about having their money in the stock market. 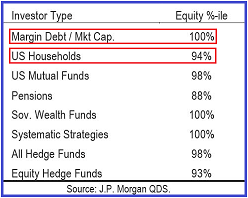 Retail margin debt, at 100% of market capitalization, is at its highest ever. The percentage of U.S. household wealth (not including home equity) invested in stocks in some form is in its 94th percentile. This is the highest allocation to equities since just before the tech bubble popped in 2000. In other words, despite the numerous warnings for those paying attention, investors have piled most of their savings/wealth into the stock market with complete disregard to the growing probability of a down-side accident. Both graphs are from John Hussman, the highly respected contrarian money manager and one of few remaining market bears (along with me and SSJ subscribers). The graph on the left is a monthly plot of SPX futures from 1998 to present. The graph on the right is Hussman’s margin-adjusted Shiller CAPE ratio chart, which shows the SPX PE at an all-time high. In the absence of meaningful real economic growth to justify the current level of the stock market relative to the two previous bubbles, the only logical conclusion is that the eventual stock crash will be twice as brutal as the last two. Another plume of smoke billowing from the stock market is the market “breadth.” The number of stocks that are moving higher as the major indices hit new record highs almost daily continues to decline. Currently, 38% of the stocks in the S&P 500 are below their 50 dma and 30% are below their 200 dma. At the beginning of the year, only 20% of the S&P 500 components were below their 50 dma. In the Nasdaq, 40% of the stocks are below their 50 dma and 35% are below their 200 dma. At the beginning of 2017, less than 20% below their 50 and 200 dma’s. The declining breadth reflects the fact that “investors” continue to chase velocity – i.e. blindly throw money at the fastest moving stocks. This is why the FANGs + AAPL and MSFT represent an absurdly disproportionate percentage of the total move higher in the stock market. Furthermore, the declining breadth of the market is now a function of the “greater fool theory.” This is an economic theory that states that the price of a stock is determined by irrational beliefs and expectations (e.g. “it’s different this time”) rather than fundamental valuation. The price paid for a stock is justified by the believe that someone else will be willing to pay a higher price. Toll reported a miss on Monday before the market opened. At the open Toll stock took back nearly the entire rise in its stock price over the trailing 30 days. Clearly no one saw this coming. Anyone who bought the stock on the previous Friday walked into an ambush and was down 10% on their Friday purchase at Monday’s open. None of this will matter as long as your trusty investment advisor or pension fund manager has your money in an SPX ETF, right? Unfortunately, at some point, the entire market is going to fall from the sky. Like the citizens of Pompeii, most investors will end up casualties of a great stock market tragedy. But like Mt. Vesuvius, warning signs abound for anyone willing to look for and accept them. Given the level of propaganda directed at convincing us that everything is great, “looking” for the warnings and “accepting” the warnings are two entirely different propositions.